Washington (CNN) - The Supreme Court's decision to uphold the national health care law may not have changed many minds regarding the controversial measure, but a new poll indicates it sure did change Americans views of the high court. According to a CNN/ORC International survey released Monday, the public is divided on last week's ruling, with 50% saying they agree with the Supreme Court's decision and 49% saying they disagree. And there is the expected partisan divide, with more than eight in ten Democrats agreeing with the decision, more than eight in ten Republicans disagreeing, and independent voters divided, with 52% disagreeing and 47% agreeing. The poll was conducted Thursday through Sunday, entirely after the high court's ruling on the Affordable Care Act. "Despite howls of protest from many Republican leaders, only about one in five Americans - and only 35% of the Republican rank and file - say they are angry about the decision," says CNN Polling Director Keating Holland. "And despite victory laps by many Democratic leaders, only one in six Americans - and only one in three Democrats nationwide - say they feel enthusiastic about the court's ruling." But what have changed are perceptions of the high court. "As recently as April, Republicans and Democrats had virtually identical positive opinions on the Supreme Court. But not any more," adds Holland. "That's the biggest change that the court decision has created." The court's approval rating among Democrats jumped by 23 points; to 73%. Among Republicans, it fell by 21 points, to 31%. Approval of the Supreme Court among independents edged up five points, to 53%. Not surprisingly, opinions of Chief Justice John Roberts are also divided along partisan lines, with a majority of Democrats holding a favorable view of him compared to only three in ten Republicans. But more than a third of all Americans are unsure how they view Roberts, probably a result of the low profile that he and his colleagues have kept for many years. Roberts sided with the liberals on the high court to uphold the law. Overall, three in ten say the high court is too liberal, with 22% saying it's too conservative and 46% saying it's about right. 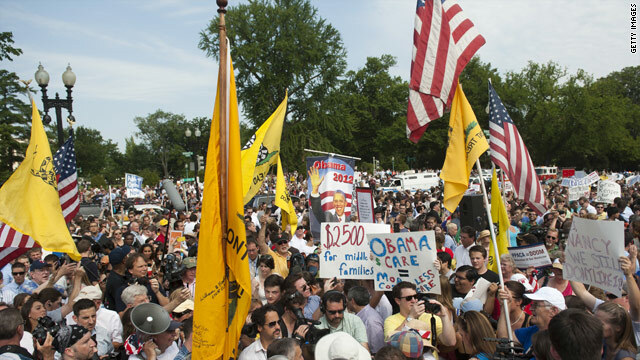 The Republican led House of Representatives has scheduled a July 11th vote to attempt to repeal the health care law. The survey indicates that 51% say Congress should repeal all provisions of the measure, with 47% saying no. What about the individual mandate itself? Forty-eight percent favor it and 51% oppose the mandate. One thing that Americans do agree on is that the health insurance mandate is a tax, as ruled by the Supreme Court. Six in ten feel that way. "But it is also worth noting that the number of Americans who favor all or most of the provisions in the bill has gone up a bit since last year, and despite roughly half looking to repeal all the provisions in the law, only one in eight say they oppose everything in the bill," says Holland. The CNN poll was conducted by ORC International from 28-July 1 with 1,517 adult Americans questioned by telephone. The survey's overall sampling error is plus or minus 2.5 percentage points. Do you agree or disagree with Thursday's Supreme Court ruling? Sound off in the comments below. Sorry Rudy, the liberal block signed the majority decision. The mandate is a TAX because SCOTUS said it does not pass Constitutional muster unless it is a TAX. That makes it 5 of 9 and now its the law of the land. Health is wealth,I could not agree more with the supreme court decisions. Americans are most hard working people,no one knows when one will get sick,having affordable health care is the ideal things to do. Once again "health is wealth"
"Republicans will try to use Reconcilliation to kill the entire law, but they won't be able to. The ACA is far more than a "spending measure." Every part of the "ACA" that was passed using reconciliation can be repealed using reconciliation. If that means killing the funding for the bill, that's what will be done. If this ruling means a lot of people that were not paying any taxes will have to start paying taxes, GOOD ! It is way past time all the people reaping the benifits started paying for it. When that tax kicks in the liberals will have a fit! The Federal Government has no business in the Welfare Business, no business in the Medical Business, no business collecting and disbursing money in most cases. They had to move the "Goalposts" to uphold this Monstrasty. Obamacare is a $27 million tax increase on the middle class. I didn't say it the CBO did. The SCOTUS says it a tax but the POTUS says it is not a tax. So SCOTUS says since it must be a tax in order to be legal then the POTUS is arguing with the SCOTUS that is it not legal in there eyes. The POTUS wants their cake and eat it too and will do anything to get it that way. The SCOTUS did not declare the penalty a tax. That argument was put forth by only 1 of the 9 justices in the SCOTUS in his written opinion. It carries far less weight than what the right wing is going to try to make it out to be. Knowledgeable court observers do not describe the ruling as 5-4, but rather as 1-4-4. The individual mandate is not a tax, it is a penalty on freeloaders; the vehicle for imposing the penalty is a tax. If you pay your share, through whatever mechanism, you are not taxed. pa2 – Are you saying ACA will insure 30 million more people at a cost of $27 million? Sounds like a winner to me. Repeal the individual mandate now! Sure, it is "nice" to know that the government can't compel commerce in order to regulate it. But that same security goes away knowing that "tax incentives" to "encourage individual behavior" has gone from a -1% on your filing percentage due to having children to a +3% TAX because you don't own something the government deems "necessary." Wake up, America. Don't be stupid. And what ever happened to "All Bills for raising Revenue shall originate in the House of Representatives; but the Senate may propose or concur with Amendments as on other Bills." If this only passes the high court's gauntlet under the "Taxing provision" and is "inextricably linked to raising revenue, as any other tax employs," then this bill is a serious threat to plain and simple observation. Read the Constitution, John Roberts. Our justices (Alito, Scalia, Kennedy, and Thomas aside) don't even know simple Constitutional provisions. WAKE UP AMERICA. Thank you, President Obama and John Robert's conservative Supreme Court for working together FOR THE PEOPLE to make health care in this country not just a luxury reserved for the wealthy. I think John Roberts is grossly overpaid. Wonder if America's trailer parks realize that socialized medicine started in this country when the extremely conservative Heritage Foundation proposed it as a way to make freeloaders pay part of their bill. Pesky fact. And will Romney try and overturn RomneyCare in Massachusetts?? Gotta love right wing filth. Folks understand that food and healthcare go together. People can not get food in form of foodstamps and are left alone when they become sick. It does not make any sense at all. If the government cares about their survival, this also includes healthcare and NOT food only. It was a 1-4-4 decision. The liberals on the court did not "sign" Chief Justice Roberts opinion. Writing the majority opinion does not mean that everyone who voted in the majority agrees with the individual writing in on every point and letter of the word. The four liberals disagreed with Roberts on the point of constitutionality under the Commerce Clause, while the other conservatives agreed with him on that point. Justices can release their own opinions and do so on a regular basis, especially when their own opinions diverge from the official "majority" or "minority" written opinions. Bravo, bravo!! Finally, someone went against there party and showed us that all politician are not corrupt. I applaud Judge Roberts for this bravery...maybe others should follow suit...he just gained my upmost respect!!! Mitt Romney, by the GOP's own definition, is a big time TAX RAISER because Mr. Romneycare instituted the individual mandate in MA. This is a loser issue for the GOP. My solution to those that don’t want to participate is simple. Instead of purchasing insurance and carrying a card, they must maintain some notification on their person, at all times, indicating they have refused to obtain insurance and do not want medical care unless they fully pay for it in advance. This applies no matter how much they beg for medical assistance. They must also accept the following. 1) They are never allowed to purchase insurance in the future and no one can purchase it for them. 2) If it is discovered that they have a contagious disease that cannot be treated by OTC medication, they agree to be quarantined, at their own expense, until they are no longer contagious or dead. Is this absurd? Of course, but so is complaining that you are ‘forced’ to purchase something you will need anyway while at the same time complaining that you are paying for someone else that did not purchase it. Want to know what the real problem with Republicans like Romney having flip-flopped on support for their own framework for health care reform? The problem stems from the 2008 campaign and Barack Obama being against an individual mandate. Romney campaigned on his health care law. After the election, Romney wrote an op-ed, which I found rather cynical, suggesting to Obama that he should adopt the MA law as a model for a national plan. You have to understand that Romney was full of "helpful" suggestions from the sidelines, all of which carried the implications that "you don't know what you are doing, so here is some advice." Romney wrote another famous op-ed about letting Detroit go bankrupt, which advised a policy that he knew a Democrat would never follow. The same expectation was held when Romney suggested to an "anti-mandate" president-elect to adopt the mandate model in MA. Much to Romney's surprise and every other Republican, Pres. Obama did adopt the MA model at the urging of his good friend, MA Gov. Patrick. But, the game plan was already in motion to be against any and every thing this POTUS might do or try to do. And so, the great Romney flip-flop on his own health care law came into being. This is what happens when advisors don't wait to get the talking points.....or when Rush is late getting them out. Sorry, the penalty for the 1% Jacob Lew put forth just doesn't hold up to common sense. The argument he uses is that it only penalizes the 1% who freeload? They don't pay for health insurance because they can pay the bills for themselves if they get sick without insurance. If you have millions why even waste your time filling out the paperwork. Their are no freeloaders in the 1% because they will pay their bills with our without insurance. If anything, this costs us more if the 1% does get sick and needs a doctor. Now insurance will pay for instead of them just paying out of pocket. Why would they even bother making this part of the law? The hospital would just send them a bill and they would pay it, they don't need insurance. they know it but because Rush says otherwise, they ignore the facts and act like good little sheep.